The hairy cells infiltrate the reticuloendothelial system and interfere with bone marrow function, resulting in bone marrow failure or pancytopenia. They also infiltrate the spleen and liver. It is relatively uncommon and accounts for 2% of all leukemia cases. It is observed mostly in males (4:1 ratio), with a median age of 52. In this case we initially looked at the blood tests which showed a pancytopenia, with the classical monocytopenia. However it is important to note that the white cells can also be raised at presentation. 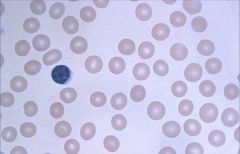 The blood was reviewed, which created some interesting reviews, as most people stated that there was a hairy cell present – however this blood film simply showed a normochromic normocytic anaemia with thrombocytopenia. A learning point from this case is to review the film carefully, and just because you suspect hairy cell, doesn’t mean that you will necessary see it on the film! Have a look again and see what you think!!! This is typical hairy cell – the projections can be seen clearly! CD11c, CD25, CD103 and CD123 are advised if hairy cell leukaemia is suspected. Immunohistochemistry on bone marrow trephine specimens should include CD20 and CD72. CD20 is the most useful immunohistochemical stain to use when assessing remission status post-treatment. BRAF V600E mutation highly specific for hairy cell leukaemia, however is also positive in melanoma. therapy on diagnosis; active monitoring is appropriate. Purine analogues (cladribine or pentostatin) are the most appropriate agents for first-line therapy. No difference in efficacy between these two agents has been demonstrated. Aciclovir and co-trimoxazole should be given as prophylaxis until the lymphocyte count is greater than 1. Patients who relapse after purine analogue therapy should be re-treated either with the same or the alternative purine analogue depending upon the duration of remission. Splenectomy can be considered if patients have symptomatic splenomegaly, particularly if marrow involvement is minimal. This entry was posted in Chronic leukaemia, Lymphoma and tagged Blood film, Bone marrow, Hairy cell leukaemia, immunohistochemistry. Bookmark the permalink.